The French Lumierre brothers created an early colour film they called Autochrome. It produced characteristic grainy images which have a charm hard to replicate, Every now and then, I give it a go. Now the Selfix is nothing special, with a fairly average lens and self energizing shutter, with a harsh action, making camera shake a very real likelihood. My attempts to make colour images with this camera, mimic those of the earliest attempts, rather than the Autochrome process. 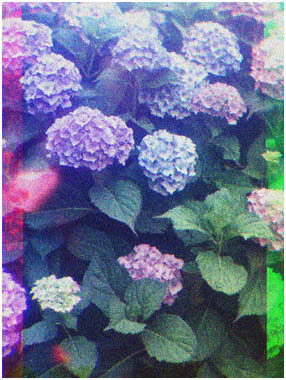 Three separate exposures through coloured filters, first Red, then Green and then Blue are made on black and white film, then processed as usual. Originally, these were then made into positives, then each image was projected via it's own projector through the same filter to be coincident on a screen. This later part is done digitally here, by scanning each negative and then putting it in the appropriate channel in Photoshop - but it's much the same process, just easier as it avoids having to get three projectors working together. The camera needs to be tripod mounted, and the filters I used were fairly dense needing a three stop increase in exposure. The camera had a bit of an issue with frame spacing, the result is the colour bands down the sides of the image, which enhances it no end. The subject is the Hydrangea in my garden, which cannot make a decision as to be blue or pink, so invariably does a half and half.